The Android Emulator can use hardware acceleration features to improve performance, sometimes drastically. This page describes how you can configure graphics and virtual machine (VM) acceleration to get higher performance from the emulator. Graphics acceleration uses your computer's hardware (typically the GPU) to make screen rendering faster. Android devices use OpenGL for Embedded Systems (OpenGL ES or GLES) for rendering both 2D and 3D graphics on the screen. When you create an Android Virtual Device (AVD) in the AVD Manager, you can specify whether the emulator should use hardware or software to emulate the GPU of the AVD. Hardware acceleration is recommended and is typically faster. However, you might need to use software acceleration if your computer uses graphics drivers that aren't compatible with the emulator. By default, the emulator decides whether to use hardware or software graphics acceleration based on your computer setup. If your GPU hardware and drivers are compatible, the emulator uses the GPU. Otherwise, the emulator uses software acceleration (using your computer's CPU) to simulate GPU processing. If you start the emulator from the command line, you can also override the graphics acceleration setting in the AVD for that virtual device instance. Create a new AVD or edit an existing AVD. On the Verify Configuration page, find the Emulated Performance section. Select a value for the Graphics: option. auto: Let the emulator choose between hardware or software graphics acceleration based on your computer setup. host: Use the GPU on your computer for hardware acceleration. This option typically provides the highest graphics quality and performance for the emulator. However, if your graphics drivers have issues rendering OpenGL, you might need to use the swiftshader_indirect or angle-indrect options. swiftshader_indirect: Use a Quick Boot-compatible variant of SwiftShader to render graphics using software acceleration. This option is a good alternative to host mode if your computer can't use hardware acceleration. angle_indirect: (Windows only) Use a Quick Boot-compatible variant of ANGLE Direct3D to render graphics using software acceleration. This option is a good alternative to host mode if your computer can't use hardware acceleration. In most cases, ANGLE performance should be similar to using host mode because ANGLE uses Microsoft DirectX instead of OpenGL. On Windows, Microsoft DirectX drivers typically have fewer issues than OpenGL drivers. This option uses Direct3D 11 and requires Windows 10, Windows 8.1, or Windows 7 SP1 with the Windows 7 Platform Update. guest: Use guest-side software rendering. This option provides the lowest graphics quality and performance for the emulator. Note: If you enable a graphics acceleration option that your computer doesn't support, you are likely to see incorrect images displayed during emulation. swiftshader: Deprecated in version 27.0.2 Use swiftshader_indirect instead. angle: Deprecated in version 27.0.2. Use angle_indirect instead (Windows only). mesa: Deprecated in version 25.3. Use swiftshader_indirect instead. When using images for API level 27 or higher, the emulator can render the Android UI with Skia. Skia helps the emulator render graphics more smoothly and efficiently. VM acceleration uses your computer's processor to significantly improve the execution speed of the emulator. A tool called a hypervisor manages this interaction using virtualization extensions that your computer's processor provides. This section outlines the requirements for using VM acceleration and describes how to set up VM acceleration on each operating system. To use VM acceleration with the emulator, your computer must meet the general requirements in this section. Your computer also needs to meet other requirements that are specific to your operating system. Warning: AVDs that use ARM- or MIPS-based system images can't use the VM acceleration that is described on this page. Most modern processors support these virtualization extensions. If you're not sure whether your processor supports these extensions, check the specifications for your processor on the manufacturer's site. If your processor doesn't support one of these extensions, then you can't use VM acceleration. Note: Virtualization extensions are typically enabled through your computer BIOS and are frequently turned off by default. Check the documentation for your motherboard to find out how to enable virtualization extensions. You can't run a VM-accelerated emulator inside another VM, such as a VM hosted by VirtualBox, VMWare, or Docker. You must run a VM-accelerated emulator directly on your host computer. Depending on your operating system and hypervisor, you can't run software that uses another virtualization technology at the same time that you run a VM-accelerated emulator. For example, VirtualBox, VMWare, and Docker currently use a different virtualization technology, so you can't run them at the same time as the accelerated emulator. VM acceleration requires a hypervisor. Without a hypervisor and VM acceleration, the emulator must translate the machine code from the VM block by block to conform to the architecture of the host computer. This process can be quite slow. With a hypervisor, the VM and the architecture of the host computer match, so the emulator can run code directly on the host processor using the hypervisor. This improvement drastically increases both the speed and performance of the emulator. You can use the emulator -accel-check command-line option to check if a hypervisor is currently installed on your computer. HAXM version 7.3.2 (4) is installed and usable. KVM (version 12) is installed and usable. 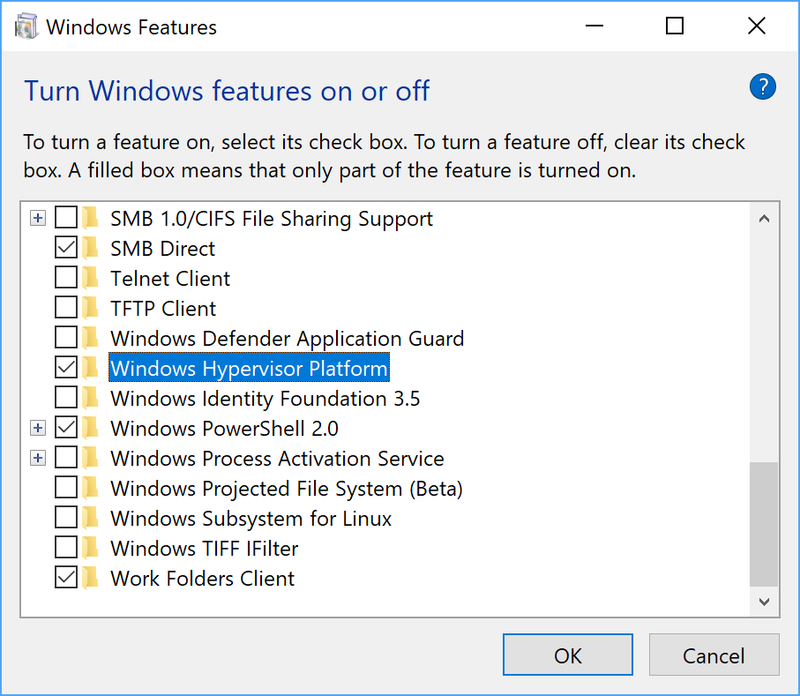 VM acceleration on Windows can use one of two hypervisors: the Intel Hardware Accelerated Execution Manager (HAXM) or the Windows Hypervisor Platform (WHPX). You have an Intel processor and do not need to run Hyper-V at the same time as the Android Emulator. Use Intel HAXM. You have an Intel processor and do need to run Hyper-V at the same time as the Android Emulator. Use WHPX. You have an AMD processor. Use WHPX. To use Intel HAXM on Windows 10 or 8, you must turn off Hyper-V in the Windows Control Panel. Note: Installing certain software might turn Hyper-V back on. Where possible, Android Studio tries to detect if Hyper-V is re-enabled and displays an option that lets you turn Hyper-V off again. Click the SDK Update Sites tab and then select Intel HAXM. Use the wizard to complete the installation. For more information, see Installation Instructions for Intel HAXM on Windows. You can adjust the amount of memory available to the Intel HAXM kernel extension by running the installer again. You can uninstall Intel HAXM using either the installer or the Windows Control Panel. Before you uninstall Intel HAXM, shut down any x86 emulators that are currently running. Intel processors: Support for Virtualization Technology (VT-x), Extended Page Tables (EPT), and Unrestricted Guest (UG) features. VT-x must be enabled in your computer's BIOS settings. AMD processors: AMD Ryzen processor recommended. Virtualization or SVM must be enabled in your computer's BIOS settings. From the Windows desktop, right-click the Windows icon and select Apps and features. Under Related settings, click Programs and Features. Click Turns Windows Features on or off. Once the installation has finished, restart your computer. On Mac OS X v10.10 Yosemite and higher, the Android Emulator uses the built-in Hypervisor.Framework by default, and falls back to using Intel HAXM if Hypervisor.Framework fails to initialize. To use VM acceleration on macOS when the Hypervisor.Framework is not available, you must install the Intel HAXM kernel extension. Note: For users of macOS 10.13 High Sierra and higher: macOS 10.13 disables installation of kernel extensions by default. Because Intel HAXM is a kernel extension, you might need to manually enable its installation. For more details, see Known Issues. For more information, see Installation Instructions for Intel HAXM. Linux-based systems support VM acceleration through the KVM software package. Follow the instructions for installing KVM on your Linux system, and verify that KVM is enabled. For Ubuntu systems, see Ubuntu KVM Installation. Running KVM requires specific user permissions. Make sure that you have sufficient permissions as specified in the KVM installation instructions. For Intel processors: Support for Virtualization Technology (VT-x), Intel EM64T (Intel 64) features, and Execute Disable (XD) Bit functionality enabled. For AMD processors: Support for AMD Virtualization (AMD-V). You can use the emulator -accel-check command-line option to check whether you have KVM installed. Alternatively, you can install the cpu-checker package containing the kvm-ok command.